MR_SLINI want to quickly and easily add name plates to my STV spectator HUD. I also want to easily disable them. Is there a convar for that? How would I add name plates? This will make it so when you toggle minmode all of the name plates are off the screen. [quote=MR_SLIN]I want to quickly and easily add name plates to my STV spectator HUD. I also want to easily disable them. Is there a convar for that? How would I add name plates? awesome! what is the code that i need to add the names in the first place? How do I change the color of these things? How could I go and permanently add a K:D Ratio onto the hud? I've seen something similar to this asked here but this thread is not very searchable. hmm, that file controls the autobalance panel when you die but not at round end or when it is voted for. Why valve would make them two seperate panels I don't know. Is there a simpler method to editing the main menu and loadout screens than editing the .res, closing the game, and reopening just to see the changes? hud_reloadscheme has never worked for me, and my old method of doing _restart in console seems to crash the game now. StaticVoidIs there a simpler method to editing the main menu and loadout screens than editing the .res, closing the game, and reopening just to see the changes? hud_reloadscheme has never worked for me, and my old method of doing _restart in console seems to crash the game now. 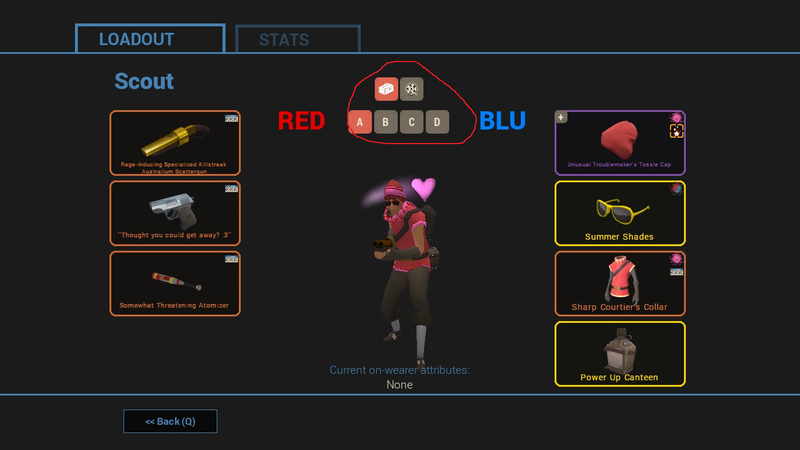 Unfortunately for loadout screens, no. With the quickplay/mvm menu however, you can just exit out and re-enter the menu for the changes to take place. healthiconpanel.res, increase the wide value for HealthIcon. RawrsorWith the quickplay/mvm menu however, you can just exit out and re-enter the menu for the changes to take place. Wow, I never thought of using that method. It works, and it's much quicker than relaunching the game. Thank you. How can i fix the "change" button? I've been trying to make it work i can't,i mean,this doesn't really bother me but i'm thinking in releasing this as a full hud and i want the hud to be perfect. Have you tried making it taller and moving it down with the ypos? JermHave you tried making it taller and moving it down with the ypos? I tried making it taller,it didn't worked. But i haven't tried moving it down. So I tried changing my main menu hud background and somewhere along the line I messed things up. While the game is loading, the background appears. But once the menu is loaded up it's just a black screen. How do I fix the target id name from overlapping with itself? deszaSo I tried changing my main menu hud background and somewhere along the line I messed things up. While the game is loading, the background appears. But once the menu is loaded up it's just a black screen. Check your background if_ entries in resource\ui\mainmenuoverride.res maybe? It could be changing the menu BG because it's the invasion update; for mine for instance I just have every event defaulting to the same background (except for invasion). That may or may not be the issue. [quote=desza]So I tried changing my main menu hud background and somewhere along the line I messed things up. While the game is loading, the background appears. But once the menu is loaded up it's just a black screen. So all I did was edit the if_ entries and it broke everything. Changing the if_entries doesn't solve the problem. Thanks for the help though. Any other ideas how to fix the black background? EDIT: So I found out adding "if_eotl_launch" and "if_community_update" breaks my hud (probably because I haven't given it a proper update in that long), but ever after removing those I'm back at square one (unbroken hud, but black background). [s]So all I did was edit the if_ entries and it broke everything. [/s] Changing the if_entries doesn't solve the problem. Thanks for the help though. Any other ideas how to fix the black background? Remove all the if_ things if you want your background to be used constantly. Also, make sure there isn't a custom black image panel sitting around in your file. That might be causing it. Is it possible to remove the box on the main menu that has all the Gun Mettle stuff in it like the links to the comic and patch notes? Or is that hard-coded into TF2? ViperIs it possible to remove the box on the main menu that has all the Gun Mettle stuff in it like the links to the comic and patch notes? Or is that hard-coded into TF2? You can. Go into your resource/ui/ folder and open mainmenuoverride.res then find EventPromo. Change the xpos and ypos to like 9999 and it should go away. I saw the capture timer be like a big popup in a stream or something. How do I make that happen?